Our friends at Vitamix recently sent us an email telling about the Holiday offers that will run until December 31st, 2014 . We are excited to announce that not only do you get Free Shipping, but you will also get 3 spatulas for free. Receiving Free Shipping from Vitamix is nothing new if you read this blog. 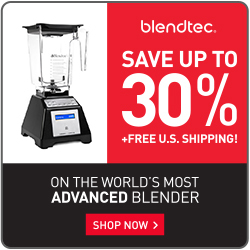 Whenever you use a link on our site or enter promo code ’06-009709′, you will automatically receive free shipping on all blenders. For the holiday season this year, Vitamix will now give priority to orders using our promo code. Typically orders take 8-15 days to receive. With the priority shipping upgrade, you will now receive your Vitamix order in 3-5 business days. We were excited to see that Vitamix is giving away a 3 pack of spatulas (retail value: $6.95) that will be shipped separately at no additional cost. The only way to get these shipped to you is by using the promo code ’06-009709′. Please note that the add on item will not appear on your screen or confirmation email when checking out. This promo is something that Vitamix will be processing after the original order is fulfilled. If you haven’t used these spatulas in the past, they are great for any blending and cooking activity. These are specially designed to fit into every corner of the Vitamix container. These spatulas are slim and lightweight for easy handling and removing thick mixtures from the blender blades. Below is a picture that clearly shows the size of the spatulas. Below is a list of all of the Vitamix Reconditioned blenders and their holiday price. Be sure to use promo code ’06-009709′ to receive FREE SHIPPING. If you have any questions about the Vitamix Holiday offer or priority shipping upgrade, please contact us!